Vote forPort Macquarie, NSWTop Regional Destinations Which are Australia's must-visit destinations? You help us decide. The mid-coast town of Port Macquarie is far more than just a scenic stopover between Brisbane and Sydney. The town is a wonderful coastal region in its own right, complete with a picturesque shoreline pocketed with sections of beautiful beach, and a lush hinterland area just begging to be explored a short drive away. The Port Macquarie region of NSW has seen relatively rapid growth in recent years, and at a glance it's not hard to see why; the region boasts an idyllic blend of comfortable weather, picturesque coastal environment, yet with enough urban development that there's more to do than many other comparable escape spots on the Aussie east coast. For travellers, this makes for one of the most balanced getaway destinations in the state outside of the bigger cities; there's the same relaxed lifestyle of smaller spots, yet far less chance of becoming bored over extended stays, too. As with any coastal destination, there's a strong bent towards all things aquatic at Port Macquarie, and as a result watersports enthusiasts will find themselves in their element here with both the Hastings River and the open ocean providing avenues for enjoyment. The waters off the coast of Port Macquarie are particularly rich in marine life of both the fish and mammal variety, with dolphins and whales (during migratory season) a frequent sight, while fishing aficionados will benefit by dropping a line for a catch of any number of popular species - all wrapped up with some lovely coastal views. Those wishing to see this spectacle in all its glory can embark on a wonderful 9km walking trail that encompass a blend of river, beach and an iconic lighthouse in the Port Macquarie Coastal Walk, which serves as the region's signature outdoor attraction. The walk also mixes in a dash of history with a range of plaques that detail past occurrences of the region, and each section of the walk has enough highlights to prevent any monotony. Look inland, meanwhile, and the greenery of the region's hinterland beckons, home to a handful of delightful national parks that intermix traditional Aussie bush with elements of gorgeous rainforest. Those looking to stay active - or keep the kids entertained - will also find that Port Macquarie delivers in spades, with a number of quality attractions focused on a mixture of history, wildlife and pure fun. Its Port Macquarie Koala Hospital is a shining beacon of animal interaction done right. Run by passionate and caring volunteers, the hospital takes care of injured or abandoned koalas in the local area and allows visitors to take a tour to see their treatment, feeding and nurturing back to health up close. Likewise, Billabong Koala & Wildlife Park allows more animal interaction with a wide range of species, horse riding is an enjoyable family-friendly activity within the hinterland, and the historic Tacking Point Lighthouse and Port Macquarie Museum serve as chronicles of the region's past. Pair all of this with a healthy dose of both dining and retail opportunities, potential for a range of guided day tours and trips to nearby highlights, and simply enjoying the weather, and Port Macquarie offers quality experiences across the board that makes it a true year-round destination for holidaymakers. Looking to pay a visit to Port Macquarie but not sure what to do? Here are some of the most essential experiences. What's new in Port Macquarie in 2017/2018? The Greater Port Macquarie region was awarded World Festival & Event City status by the International Festival & Events Association (IFEA), at an awards ceremony held in the USA. A $4 million transformation of Port Macquarie’s Breakwall holiday park will revitalise the waterfront site into a modern and dynamic tourist destination. 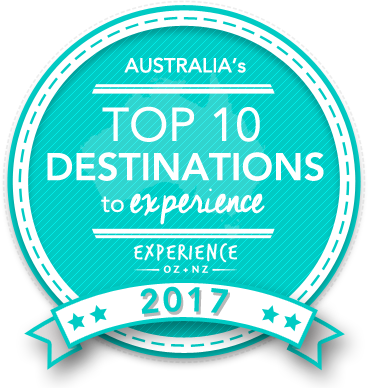 Is Port Macquarie Australia's Top Regional Destination to Experience for 2017? Vote now for the chance to WIN an epic trip to one of Australia's top destinations!